They say that people who love automobiles either love them for the look, or for the speed. People who are into the aesthetics of automobiles are often more interested with pimping their rides to make it look more unique, and loading it with different gadgets and custom upholstery. The second group of people, the ones who love automobiles because of the speed thrill, lean more towards cars that can go from zero to a hundred in just a few seconds. Turbochargers are extremely popular with people who have the need for speed. Turbochargers are actually just a kind of supercharger, but are now considered a completely different thing because they work differently. 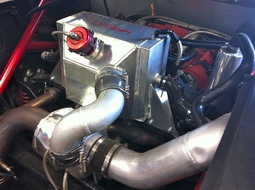 Superchargers depend on the vehicle’s belt in order to boost speed. Turbochargers, on the other hand, provide additional speed using the car’s exhaust gases. When oxygen enters your vehicle, the turbocharger compresses it so that more oxygen can enter. The more oxygen there is inside the vehicle, the greater the power output will be. Higher power outputs mean you can maintain higher speeds for a longer period of time. However, this does take a toll on the turbocharger and the engine, especially when you overdo it. This is why most racers and speed fanatics often have turbocharger spares lying around, in case the performance of their current turbocharger fluctuates. Turbochargers are divided into two main parts: the compressor and the turbine. The compressor is responsible for compressing the air that enters into the car’s engine. This allows more air to enter the engine within that short period of time. The turbine will then use the exhaust gases that are emitted to power up the compressor. The more air the engine takes in during this process, the better the boost will be. So the best turbochargers would be those that have excellent compressing abilities so that more air can fill up the engine. Turbochargers are great additions for customized vehicles and cars that were meant for racing. Remember though that not all models can withstand the speed boost offered by a turbocharger. The compression ratio offered by a turbocharger is completely different from normal aspiration, so engines that are meant only to run on normal aspiration should not be equipped with turbochargers. Making this mistake will either ruin your engine, your turbocharger, or both. If you don’t know much about cars, resist the temptation of customizing yours by yourself, unless you’re prepared to spend money on extra engines and turbocharger spares. Although some engines will work with a turbocharger, the performance is greatly decreased and you won’t notice much of a boost, making the whole thing pointless. If you love speed and would like to know if you can fit turbochargers into your vehicles, call a professional today to have your car looked over. It is generally better to have a professional perform the installation and testing for you. To be on the safe side, make sure the professional you’re working with is ASE certified. While turbocharged cars are a way of showing that you live life on the dangerous side, it’s still practical to make the installation and customization bit as safe as possible. After all, you wouldn’t want there to be any accidents before you even get behind the wheel. Denzel Zurich is a freelance writer with a fondness for racing and customized cars. He runs a blog that gives detailed and easy-to-follow guides on how to customize cars with speed in mind. He is also an avid collector of superchargers, turbocharger spares and custom racing tires.